The tax free era in UAE has now completely ended. With the start of taxes on various goods and services, people are getting introduction for paying extra on various items. The UAE government is also trying to reduce problems of common people by providing complete information about the goods and services affected by VAT (value added tax). The government has also advised people to get complete information about VAT-related goods in order to avoid paying higher on different items. For this purpose, the details of different items are available on the website of concerned department (DED) while they can also launch their complaints by using email address and phone number of DED. But an important point to note is the fact that there are unregistered retailers also present in UAE and they can overcharge the customers on purchasing of different goods. ICAI Dubai chapter’s chairman, CA Naveen Sharma, provides valuable advice for consumers on how to save their money by not paying extra cost to retailers. Sharma says that the first thing is to check the TRN (Tax Registration Number) of retailer and the amount of VAT on the bill. It is mandatory for registered retailers not only to mention amount of VAT separately on the bill but also to show their TRN. 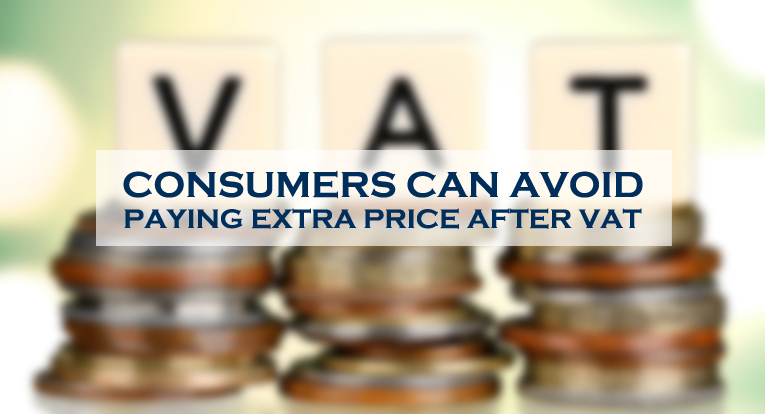 Consumers are not liable to pay VAT if any of these conditions is not fulfilled. It is also important for shoppers to know the difference between standard rated, zero rates and exempted supplies. There are several supplies that are either zero rated or exempted from VAT, and the tax is not applied on such items. He also advised that they should make a monthly plan after fully knowing about the prices of various products that they need. One should stick to this plan in order to spend the money wisely and also to save some money that can be required at any given time.